Salvia hispanica seeds have been commonly used by people that seek healthy habits through natural foods to reduce cholesterol and triacylglycerides levels, however, the evidences that support this assumption are still scarce in literature. Here, we aimed to evaluate the lipid lowering effects of chia by using Caenorhabditis elegans as animal model, a nematode that has proven its usefulness for lipid metabolism studies. We prepared hexane (HE) and Bligh-Dyer (BDE) extracts, evaluated and compared their safety, antioxidant potential and their lipid-lowering activity in the worms. The characterization of both extracts demonstrated that there were no differences in their lipid composition; however, BDE depicted better antioxidant potential. 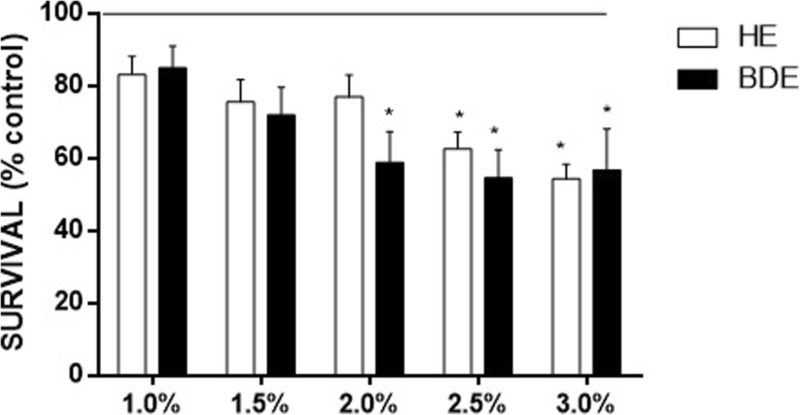 Both extracts reduced worm’s survival from 2%, and reproduction was reduced following treatment with both extracts, though a more notable effect was observed in HE-treated worms. In addition, the non-toxic concentration of both extracts (1%) increased stress resistance against paraquat toxicity in an antidote paradigm. Notably, this same concentration of both extracts reduced lipid accumulation in obese worms, which was not caused by food deprivation. Taken together, our data demonstrate that both extraction methods from chia seeds result in oils that are rich in mono and polyunsaturated fatty acids, which may modulate lipid accumulation and provide antioxidant resistance in C. elegans. Major current health problems have been associated with increasing obesity in the population. Overweight can lead to development of disorders such as cardiovascular disease, type 2 diabetes, and colorectal cancer [1, 2]. Diet and lifestyle can be modified to prevent and diminish the risks associated with excessive body weight. Despite cultural differences in food consumption and cuisines worldwide, there is epidemiologic evidence indicating that diets that promote “healthspan” are most of the time high in dietary fibers, relatively high in ω-3 fatty acids and low in saturated fat, trans fat, and cholesterol . Notably, diets that promote a healthy lifestyle are those rich in fruits and vegetables, whole grains and fish, all of them low in saturated fat [1, 3]. In this context, the use of the seeds of Salvia hispanica L. (Labiatae), commonly known as chia, has been diffused from the natives in central and southern America to the people all around the world that seek healthy habits through natural foods population because of its nutritional properties [4, 5]. Mainly cultivated because of its seeds, S.hispanica also produces white or purple flowers, however the seeds are the most consumed structure and consequently best studied [6, 7]. Notably, the seeds contain oil which has, as major constituents, triglycerides, 25 to 40% of fat acids, 60% of them comprising ω-3 alphalinolenic acid and 20% of ω-6 linoleic acid, which are considered essential fatty acids required by humans . Furthermore, chia seeds are composed of proteins (15–25%), fats (30–33%), carbohydrates (26–41%), high dietary fibers (18–30%), ashes (4–5%) and vitamins . They also contain a high amount of antioxidants, such as myricetin, quercetin, kaempherol, and caffeic acid, which makes the oil quite stable despite of its high polyunsaturated fatty acids (PUFA) content . These natural antioxidants have been demonstrated to have potential protective effect against the damaging action of reactive oxygen and nitrogen species, which play important role in obesity-related diseases [9, 11]. In agreement, the pharmacological properties of the seeds have been assessed, including in clinical trials. Particularly, it has been reported that the administration of chia seeds improves post-prandial glycemia in healthy subjects, inhibits growth and metastasis of adenocarcinoma and improve cardiovascular risk factor in type II diabetes [12–14]. On the other hand, a study with overweight adults reported that 25 g of chia seeds consumption for 12 weeks did not promote weight loss or improved in risk factors endpoints . Considering these contradictory reports in scientific literature, the safety and effectiveness of chia seeds are not completely proved. To study lipid metabolism and antioxidant effects of chia seeds oil extracts the use of a simple model with ease of manipulation as Caenorhabditis elegans can be of great advantage . These nematodes have a short life cycle and a short lifespan, making faster to evaluate parameters affected by obesity, as an example of a metabolic disease . In addition, several studies revealed a strong conservation in molecular and cellular pathways between worms and mammals . Indeed, subsequent comparison between the human and C. elegans genomes confirmed that the majority of human disease genes and disease pathways are present in C. elegans, including those related to lipid metabolism . Remarkably, the nematode C. elegans is a good model for studying the physiological functions of unsaturated fatty acids . Besides, modification of the nematode cellular membrane’s fatty acids can be achieved by dietary supplementation with fatty acids . Thus, considering the chia seeds oil pharmacological potential, we hypothesized that the oil extracted from these seeds would reduce lipid accumulation in worms and that this effect would be associated to an additional antioxidant effect. Furthermore, we aimed to compare two different extractions in order to verify which one would be more efficient, as hexane is commonly used by the industry to extract cooking oils, whereas, Bligh-Dyer method is employed to extract essential oils from fruits and to produce cosmetics, as it reduces the solvent residues in the product and does not use heat to remove solvents [22, 23]. Chia seeds were purchased from local traders (brand DUBAI®), once it was the only one found properly stored and presenting its nutritional information on the package. All other reagents were purchased from Sigma or other local suppliers. To extract the oil from the seeds of Salvia hispanica L. (Chia), two different procedures were performed; 5 g of seeds were transferred to a porcelain pot and carried out for the following extraction methods: 1) Hexanic extract (HE): seeds were crushed using a pestle and then macerated by addition of 150 mL hexane for 72 h. Solvent was evaporated at maxim 60 °C and 100 mL hexane was added once more. The same procedure was performed at least two additional times, until total depletion of seeds. The remaining oil of all procedures was mixed and weighted (yield of 16.08%) and stored at − 20 °C; 2) Bligh-Dyer method (BDE): This method consists of a lipid extraction characterized by mixing chloroform, methanol and water (1:2:0.8) to the sample, followed by continuous stirring for 30 min in the cold. After adding chloroform and sodium sulfate 1.5%, solutions were agitated for 2 min and solvents excess (lower layer at the end of the process) were removed with a pipette. The remaining extract was filtered to remove sodium sulfate from the oil . The yield obtained was of 28.26%. Further, the concentrated oils (HE and BDE) were diluted in five concentrations: 1, 1.5, 2, 2.5 and 3% (% of total oil bulk), using dimethyl sulfoxide (DMSO) as solvent. The stock solutions were prepared and stored at − 20 °C, and thawed no more than three times in order to prevent possible changes in the oil composition. Fat was extracted using chloroform and methanol as described by Bligh and Dyer (1959) and used for determination of the fatty acid profile. To prevent lipid oxidation during and after analysis, 0.02% butyl hydroxy toluene was added to the chloroform used. Fatty acid composition was determined by gas chromatography. Fat was saponified in methanolic KOH solution and then esterified in methanolic H2SO4 solution. The fatty acid methyl esters (FAME) were analyzed using an Agilent Technologies gas chromatograph (HP 6890) fitted with a capillary column DB-23 (50% cyanopropyl-methylpolysiloxane, 60 m × 0.25 mm × 0.25 μm) and flame ionization detection. The temperature of the injector port and the detector was set at 250 °C, and the carrier gas was nitrogen (0.6 ml/min). After injection (1 μl, split ratio 50:1), the oven temperature was held at 120 °C for 5 min, increased to 240 °C at a rate of 4 °C min− 1, and held at this temperature for 10 min. Standard fatty acid methyl esters (37-component FAME Mix and PUFA no. 2 from Sigma, Saint Louis, MO, USA) were run under the same conditions and the subsequent retention times were used to identify the fatty acids. Fatty acids were expressed as percentage of the total fatty acids content . The analysis of antioxidant activity was assessed by the reduction of the free radical 2,2 diphenyl-1-picrylhydrazyl (DPPH), according to Brand-Willians . The absorbance was then obtained at 515 nm. The radical scavenging activity was calculated as follows: I% = [(Abs0 - Abs1)/Abs0] × 100, in which Abs0 was the absorbance of the blank and Abs1 was the absorbance in the presence of the test compound at different concentrations. The concentration providing 50% inhibition of DPPH absorbance (IC50) was calculated graphically using a calibration curve in the linear range by plotting the extract concentration versus the corresponding scavenging effect. The ferric reducing ability of plasma (FRAP) was performed following the methodology of Pulido . The experiments were performed by using spectrophotometry. The total antioxidant activity was defined as the concentration of antioxidant having a ferric-TPTZ (2,4,6-tripyridyl-s-triazine) reducing ability equivalent to that of 1 mM FeSO4.H2O/g of extract. C. elegans strains wild-type Bristol (N2) and DG2179 (tub-1(nr2044)) were obtained from the Caenorhabditis Genetics Center (University of Minnesota, Saint Paul, MN, USA). Both strains were maintained on nematode growth medium (NGM) plates seeded with Escherichia coli OP50 at 20 °C. Synchronization was done in order to obtain the worms at the same larval stage, through the lysis of gravid nematodes using a bleaching mixture (1 mL NaOH, 4 mL HOCl). The synchronized population was maintained for 12 h at 20 °C until the eggs had hatched . After the eggs hatched, worms were treated at L1 (the first larval stage) using a total of 2000 worms per treatment. Worms were treated with 1, 1.5, 2, 2.5% or 3% of each extract in M9 buffer for 30 min in the absence of E. coli. Right after we carried out three washes with M9 buffer in order to remove the oils. The worms were conditioned in Petri dishes containing E. coli as food source for 24 h when survival was scored. Worms were treated for 30 min at the L1 stage as described above and then incubated at 22 °C with E. coli until they reached the L4 stage. Worms were washed until removing all existing bacteria. To measure triglycerides, worms were frozen, sonicated, centrifuged and then supernatant was pipetted on microplates (50 μl of each sample). 150uL of the reagent (Labtest kit) was added and the mixture was incubated for 10 min at 37 °C, and then read at 500 nm. Data were calculated by using a standard curve. For normalization of the data, protein was determined by Bradford (1974) colorimetric method . Using the same treatment protocol, treated worms were conditioned for 48 h at 22 °C until they reached L4 stage. 50 worms were transferred to 96 wells microplate containing M9 and 5 μL of AdipoRed Assay Reagent (Lonza). The lipid staining was performed for 1 h at room temperature and then worms were washed to remove excessive dye. Then, fluorescence was measured in an FP-6200 system (JASCO Analytical Instruments, Easton, MD, USA) with excitation wavelength of 485 nm and emission 535 nm. Data were calculated as arbitrary units of fluorescence (AUF)/μg of protein. In order to evaluate whether the effects of the chia extract were due to reduced food consumption, five L4 worms were transferred to a new NGM plate seeded with bacteria E. coli OP50 and then the pumping movements of the pharynx were scored for 1 min. The assay was performed at least three times. To determine brood size, twelve worms from each treatment, at L3 stage, was individually transferred to new NGM/OP50 plates every 24 h (in triplicate). Each worm’s progeny was counted daily until no further progeny was produced. For lifespan assays, 20 worms (in duplicate), were transferred to NGM/OP50 plates every day until the last live worm remained. For all assays, the number of surviving animals was monitored daily until they all died. Nematodes were considered to be dead when they did not respond to a mechanical stimulus with a platinum wire or no pharyngeal pumping was observed. To induce oxidative stress L1 worms were exposed to paraquat (1,1′-dimethyl-4,4′-bipyridinium dichloride; PQ) using commercial Gramoxone 200® at 1 mM for 30 min, before or after treatment with the extracts. Then the survival was scored 24 h post-exposure. Each experiment was performed at least five times. All data are expressed as mean ± standard error of the mean. For in vivo endpoints, one or two-way analysis of variance (ANOVA) were performed and Tukey post hoc test was used to verify differences between groups, depending on the primary analysis. The lifespan was analyzed by repeated measures ANOVA. In vitro assays were analyzed by t-test of Student. A p < 0.05 was considered statistically significant. Fatty acid composition of the extracts is shown in Table 1. Average content of C14: 0, C16: 1, C18: 1 (Δ7), C20: 0 and C20: 1 (Δ9), were lower than 0.5% of total fatty acids. There was no significant difference between all analysed fat acids. The analysis demonstrated that both extracts resulted in good sources of SFA but mainly MUFAs and PUFAs, ω − 3 alphalinolenic acid and and ω-6 linoleic acid. The antioxidant activity measured by DPPH depicted difference between the extraction methods. Notably, BDE showed a higher antioxidant activity, as the IC50 was lower than the one found for HE (Table 2). This antioxidant potential of BDE was also observed in relation to Fe-reducing ability power; both extracts exhibited a significant reducing potential when compared to the control (FeSO4), however BDE was significantly higher. We observed that worms treated with chia HE or BDE presented similar mortality rates (Fig. 1). Significant decreased survival caused by BDE extract was observed from 2.0% and by HE from 2.5%. Two-way ANOVA revealed that there was no mortality difference between extracts exposure independent on the concentration used. Figure 2a illustrates that HE and BDE treatment reduced lipid droplets accumulation in wild type worms in a similar manner (no main effect) from 1.0% (Fig. 2a). In addition, we observed a similar significant reduction in the TGs levels in worms treated with both extracts when compared to untreated worms, however the effect was observable at 2% (Fig. 2c). In order to verify this effect in obese animals, we used tub-1 mutants, which accumulate higher amounts of lipids around the gut. We observed that only the mutants treated with lower concentrations of BDE (1.0%) depicted a significant reduction in the concentration of lipid droplets (F (3.12) = 16.79, p = 0.0015 – main effect of extract type and F (3.12) = 3.967, p = 0.0354 – significant interaction between concentration and extract type, Fig. 2b). On the other hand, tub-1 mutants treated with HE depicted decreased levels of TGs while no changes were observed in worms treated with BDE, however two-way ANOVA did not indicate a significant difference between extracts (Fig. 2d). These lipid-lowering effects were not due to dietary restriction or starvation, as worms continued to pump their pharynx normally (Fig 2e). A significant reduction of brood size, following HE treatment, was observed at all tested concentrations. The same reduction was only observed at BDE 2% (Fig. 3a). Two-way ANOVA indicated a significant difference between extracts (F 1.24 = 14.16, p < 0.001) and also a concentrations dependence (F 3.24 = 12.01, p < 0.0001). Furthermore, worms treated with the non-toxic concentration of 1% of HE or BDE presented significant increase in their lifespans (Fig. 3b and c). Extracts treatment did not protect worms from the mortality induced by pro-oxidant agent PQ (Fig. 4a). Instead of, they were able to protect against the reduced survival induced by PQ (both at at 1.0 and 1.5%, Fig. 4b). Two-way ANOVA indicated that there was no main effect by the different extracts’ treatments. The present study demonstrated that two different oil extracts of S. hispanica (chia) seeds presented lipid lowering effects in C. elegans. We have observed a reduction triglycerides and lipid droplets (containing triglycerides and cholesterol esters) without any alteration in pumping rate, which could be, somehow, linked to the increased lifespan and increased stress resistance of the animals following chia seeds oil exposure. Chia oil products are quite recent in the market. European Union has approved the first chia oil in 2014 whereas the Brazilian National Sanitary Surveillance Agency has approved these products in 2012. However, the effects of these oils have not been totally studied, as their properties after ingestion can be completely different from the ingestion of the whole seeds . Initially, we performed HE and BDE characterization, as they were not yet described in the literature. We observed that HE and BDE have high contents of ω-3 in relation to ω-6 and a low quantity of monounsaturated fatty acids. In this context, the seeds oil of S. hispanica becomes a good functional food as currently, diets are based on high intake of ω-3, ω-6 fatty acids and SFA; chia seeds contain the highest known plant source of ω − 3 α-linolenic acid, differently from linseed oil, another source of ω-3 . Studies with C. elegans demonstrated that most of PUFAs improve development and reproduction in worms lacking desaturases, but no effect was observed in wild-type worms . On the other hand, worms cultured in DGLA (20:3Δ6) became sterile. We could not measure 20 carbons PUFAS in our oil extracts, however previous studies demonstrated their presence in chia seeds. Free-living nematodes have the ability to synthesize saturated and unsaturated fatty acids and they typically store energy as lipids. This nematode has fat stores mostly under the epithelial cells and around the intestine . Lipid droplets accumulate not only neutral lipids as triglycerides, but also cholesterol esters . Recently, it was found that most lipid species in C. elegans (triglycerides, phospholipids, sphingolipids, etc.) are composed of fatty acids directly absorbed from the bacterial food source, because lipid droplets accumulate not only neutral lipids as triglycerides, but also cholesterol esters . Up to 35% of the dry body mass of C. elegans is lipidic, and triacylglyceride fat stores (~ 40–55% of total lipids) are the major energy storage molecules independent on diet and growth stage . Thus, this model allowed us to observe that besides causing a reduction in reproduction, the extracts also caused a significant reduction in triacylglycerides levels and a decrease in fat stores, as visualized by AdipoRed assay. This finding is in accordance to previous studies with chia as a slimming agent or just as a reducer of fat stores, an activity that is sought in certain foods in order to control overweight [37–39]. 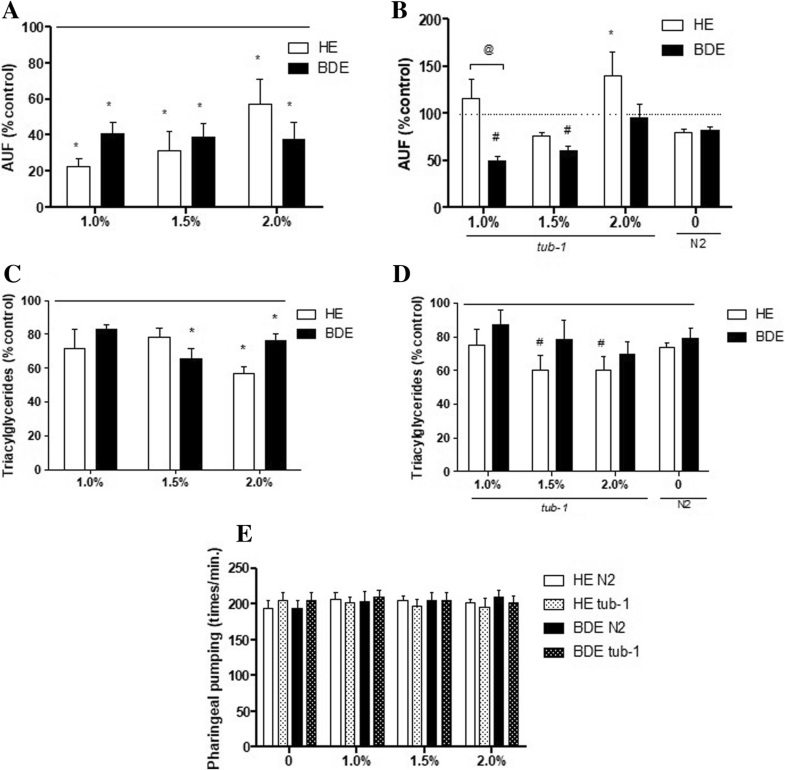 Taken together, the reduced fertility response to the treatment with S. hispanica L. seed oil extracts may be related to reduction in lipid accumulation. Previous studies report that C. elegans transports dietary fatty acids from the intestine to the developing germ line, where lipids are transferred to the gonad during larval development to provide energy for mitosis, meiosis, and transcriptional and translational activities of germ cell nucleus. It is also known that in order to generate future embryos these lipids are mobilized and consequently a number of germ cells are developed . tub-1 is a gene that affects fat storage and works with kat-1, a thiolase from beta-oxidation pathway. Without tub-1, worms do not perform lipolysis properly, then they accumulate more fatty acids . In the absence of tub-1, BDE still reduced total lipids levels and HE still reduced triacylglycerides. Therefore, we can infer that chia does not act by activating beta-oxidation. Usually, chia effects in weight loss and in lowering triacylglycerides and cholesterol levels are attributed to the satiety effects of the seed’s ingestion . Our study, however, demonstrates that even in the loss-of-function mutant, worms kept ingesting food (no alteration in the pharyngeal pumping) however they do not accumulate fat, maybe by modulation of fat accumulation. It has been described that ω-3 fatty acids EPA and DHA, both of which are present in our oil extracts, stabilize mitochondrial membranes, which integrity is required for proper oxidation-reduction steps in aerobic respiration. Moreover, many of these lipids, particularly ω-3 acids and ω-6, can increase resistance to free radicals attack and reduce lipid peroxidation . There are many aggressors that can cause damage at the mitochondrial level and, consequently, at a cellular level, one of them is PQ. PQ is an herbicide commonly used in agriculture that when absorbed through the inner membrane of mitochondria acts directly on complex I of the electron transport chain, reacting rapidly with oxygen and generating superoxide anion . HE and BDE were able to revert, but not to protect, the damage inflicted by PQ. As our extracts displayed no significant difference between the analyzed lipid components, it is reasonable to suggest that these lipids or other components extracted and not measured (as phenolic compounds) may be reacting directly with the free radicals generated by PQ, preventing biomembranes from oxidation or even by modulating the turnover of the membranes phospholipids [43, 44]. Accordingly, we observed that both HE and BDE displayed antioxidant action by reducing the DPPH radical. The DPPH free radical scavenging method offers the first approach for evaluating the antioxidant potential of a compound or an extract . We also evaluated the Fe reducing capacity, and the same antioxidant potential was displayed. This agrees with a study using Anethum graveolens L (Dill) that has shown DPPH radical scavenging activity and a high FRAP value. The reducing power can provide a significant antioxidant activity and notably certain natural antioxidants are notorious for their reducing activity . The nematode longevity is in part modulated by lipid metabolism through effects on desaturation of fatty acids, lipolysis, and autophagy . 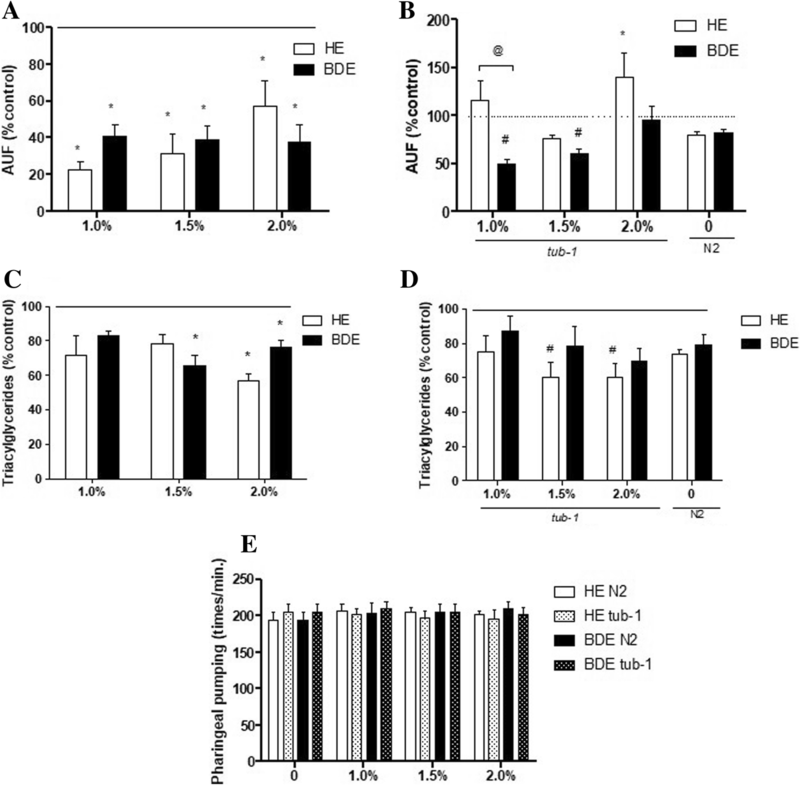 In agreement, a recent study demonstrated that a form of senescent obesity is associated to conversion of intestine into egg yolk by autophagy and that inhibition of vitellogenesis and or intestinal autophagy can extend lifespan . Besides that, the simply ingestion of a functional food and the bioactive molecules presented in them can modulate metabolic pathways by altering hormones . Finally, lifespan increase can be caused by antioxidants present in plants, by activation of DAF-16 pathway [50–52]. Our study was pioneer to compare different oil extraction methods from chia seeds. They presented similar fatty acid composition, however, taken all the data together and statistical analysis in all assays, BDE depicted more beneficial effects that HE, but probably both of them have activity not only due to omega-3 but to a complex mixture of many different phytochemicals and bioactive molecules which combined have interesting biological effects. Considering the solvents used in both methods and the whole technique, BDE is faster, uses polar solvents, which may extract polyphenols (that could not be measured in our extract due to technical issues) and does not use heat to evaporate the solvent, resulting in a good yield. 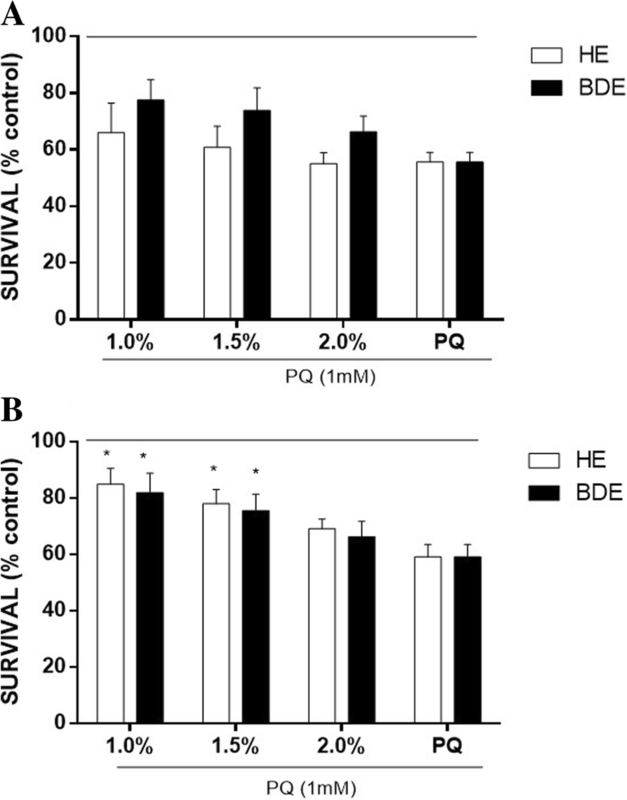 At low concentrations, BDE reduced triacylglycerides and fat stores in the obese model tub-1, and also reverted PQ toxicity, thus reinforcing its beneficial use as a functional food. Furthermore, these low concentrations caused a longer longevity without changing fertility in C. elegans. However, the mechanisms and signaling pathways modulated by this extract are still missing, requiring further research for guaranteeing the efficiency of the of Salvia hispanica seed oil in combating obesity without causing toxic effects. CAPES, CNPq, UNIPAMPA and FAPERGS for their funding and support. Authors thank to CNPq (W.G.S. schollarship), FAPERGS (Grant # 1919012–5), CAPES (C.F.R. schollarship) and UNIPAMPA (Edital Grupos de Pesquisa/PROPESQ) by the financial support. D.S.A is recipient of CNPq researcher scholarship. Upon request, all the data will be available to journal and readers. Conceptualization, RP, CD and DA; Data curation, CR, WS, MB and JV; Formal analysis, CR, RP and CD; Funding acquisition, RP, TE and DA; Investigation, CR, WS, MB and JV; Methodology, JV, TE, CD and DA; Project administration, CR and DA; Supervision, DA; Writing – original draft, CR and WS; Writing – review & editing, RP, TE, CD and DA. All authors read and approved the final manuscript. Mohd Ali N, Yeap SK, Ho WY, Beh BK, Tan SW, Tan SG. The promising future of chia, Salvia hispanica L. J Biomed Biotechnol. 2012;2012:171956. https://www.ncbi.nlm.nih.gov/pubmed/23251075. Dal Forno AH, Câmara D, Parise B, Rodrigues C, Soares J, Wagner R, Ribeiro S, Folmer V, Puntel R, Haas S, et al. Antioxidant and lipid lowering effects of dried fruits oil extract of Pterodon emarginatusin Caenorhabditis elegans. Arab J Chem. 2016. https://www.sciencedirect.com/science/article/pii/S1878535216300259.